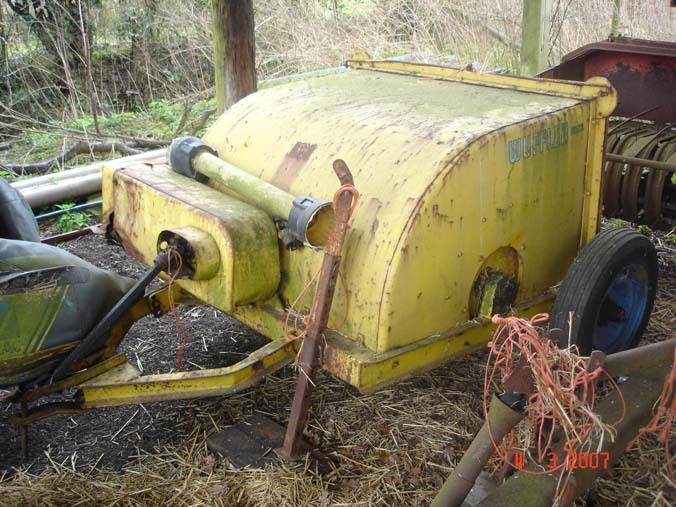 This Wuffler was purchased in good working order from a farm sale during April 2006, and was put to work on hay in 2006; some pictures of it working can be viewed here. It is an excellent piece of kit and proved to work very well. After using a borrowed Acrobat for hay making a few years ago, I decided to buy one. The one I borrowed was ideal behind the Fergy as it was fairly small, however, I did not realise until I got this one home that it was quite a bit wider, clearing 14ft of ground at a time! It proved to work well (see photographs here) however would benefit (as most acrobats would!) from some new bearings. I have also got two further Acrobats in bits which could make one good one when time permits. 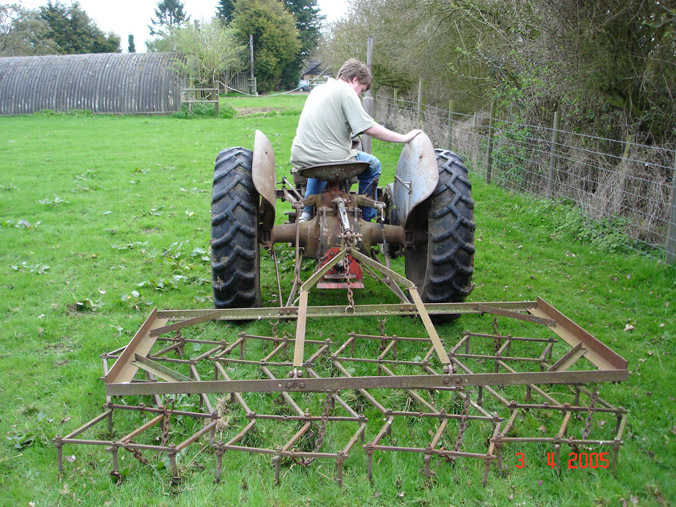 Using an old Ferguson tool frame, we have mounted the harrows we use for grassland, allowing us to get into tight corners and move easily between fields. We went into this project with little thought, and the overall design could be better – although they seem to work well! Photographs of them working can be viewed here. 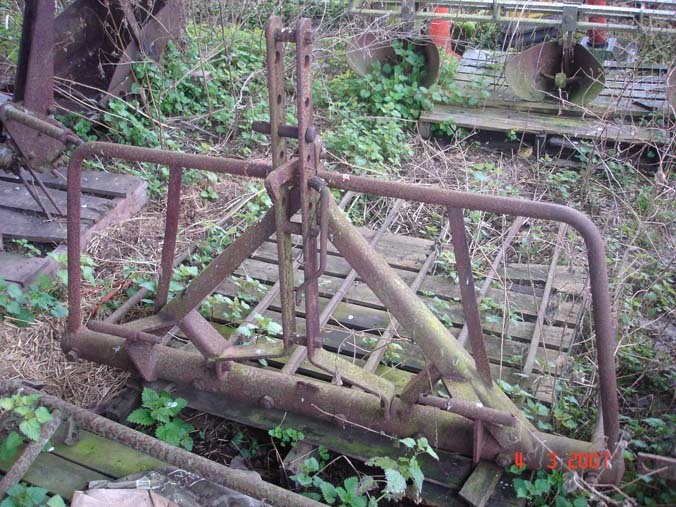 This Steel-Fab buck rake was a present from good friend, the Late George McGhee. It is in very sound original condition, and has down very little work in its life. We have used it for clearing wet hay. One tine is very slightly out of line and it could really do with a coat of paint to preserve its condition. 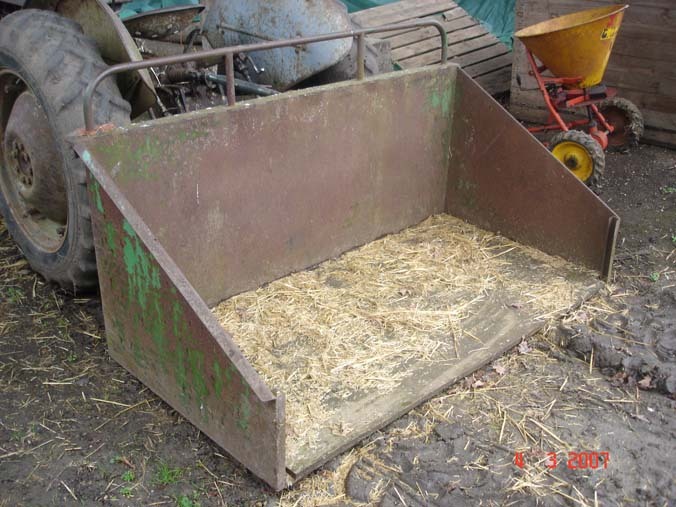 The load box was purchased from local Ferguson expert Gavin Argent, and has proved to be the most useful tool we have at Rhodds’s Farm, spending the majority of its life on the back of the tractor. It is a very handy size, being able to carry 12+ bales; we have even used it for moving ewes and lambs. The floor is fairly rusty (and has been covered in ply as a temporary measure); new steel is ready to be cut and fitted when time permits. 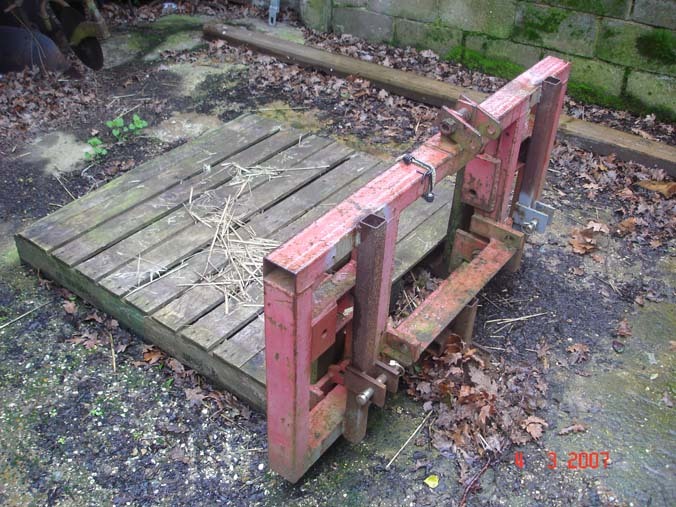 The second most useful implement we have are these pallet forks, which were purpose built in a farm workshop some time ago (we purchased them from model marker Martyn Reeve). They have proved excellent for moving implements around the yard, without having to hitch them up (before we had the loader tractor). We have converted them to double up as a bale spike (pictures here) and recently have had brackets welded on them, so they fit the High Lift Loader. However, this was not very successful due to the weight of the forks.